The Housing Association for Integrated Living (HAIL) was founded in 1985 as a nonprofit voluntary organisation. The development of the association was a result of an initiative by members of St. Brendan's Mental Health Association and others following the preparation of the report, Let's Look at Housing. 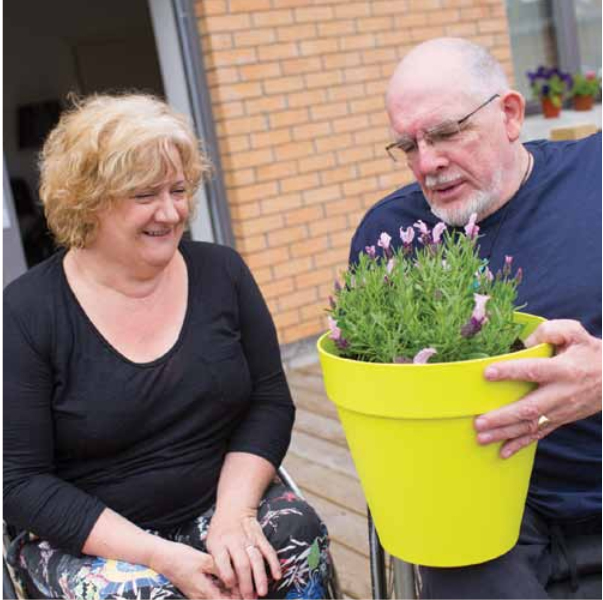 This report identified the housing needs of single socially vulnerable persons, some of whom had been patients in hospital or other institutions and often have difficulty in coping on their own, or at least need start up help to integrate into the community. HAIL has since developed into a successful voluntary housing association providing exceptional quality social and affordable rented accommodation for people from local authority housing waiting lists, primarily those with mental health difficulties. HAIL is governed by a Board of Directors who volunteer their expertise, services and time to ensure the highest quality standards of governance and management of the organisation. Building and sustaining integrated community living is at the core of our work. HAIL has a dedicated team of community based Mental Health Tenancy Sustainment Workers who provide individually tailored services to support people with mental health difficulties to integrate and live independent lives in the community. We currently own and manage over 360 homes in the greater Dublin area and surrounding counties. Our committed team ensures that the highest standards of accommodation is maintained. This includes carrying out repairs and maintenance, collecting rent, managing our void properties, working with the local authority on allocations and looking after our estates. Our dedicated team of community based Mental Health Tenancy Sustainment Workers provide a wide range of individually tailored services to support people with mental health difficulties to integrate and live independent lives in the community. Our Strategic plan outlines our growth programme of increasing our number of homes by up to 10% per annum over the next number of years. We are actively looking for opportunities to work in partnership to deliver this ambitious programme. How are people selected for HAIL accommodation? When a vacancy arises for one of our In-House supported tenancies, we contact the appropriate Local Authority for a nomination. When the Local Authority has nominated a client from their housing waiting list, HAIL will make contact with the appropriate mental health team to request a referral. For a General Needs Vacancy, we contact the relevant local authority, and this vacancy will be filled by a selection from their housing list. Please note that you must be registered with your Local Authority on their Housing List and have a valid registration number in order to be eligible for any form of social housing. You can only apply for housing in the local authority in which you are registered. We advise you to notify your Local Authority that you would have an interest in being housed by HAIL. It is important to keep in touch with your Local Authority in relation to your interest in HAIL. If you are linking in with a Community Mental Health Team, and are seeking accommodation with visiting support, we would advise that you speak with your consultant / nurse /social worker regarding making contact with your selected Local Authority. Can I apply directly to HAIL for a property? You cannot apply directly to HAIL. Please note that we do not take self referrals and do not hold a waiting list. Is there an option to share accommodation? In some cases there is an option to share accommodation and if you wish to do so please contact your Housing Officer to discuss this. What kind of support does HAIL offer? We have a team of community based Mental Health Tenancy Sustainment Workers who provide a wide range of supports to help people settle into their homes initially, integrate into their community and manage their tenancy. The amount and type of support will vary depending on your needs and will be very specific to you. Can I access support services if I am not a HAIL tenant? Yes you can. HAIL has a team of Mental Health Tenancy Sustainment Workers who work with people who are not HAIL tenants in Dublin City, South Dublin, Fingal and Dun Laoghaire Rathdown Council areas. Clients of the service live in local authority, private rented or other housing association accommodation. The team work with people who are at risk of losing their tenancy due to a mental health crisis.